Ashley is a journalist based in Austin, Texas. Her work appears in The Atlantic, ELLE, GOOD Sports, espnW, VICE Sports, Health, Men’s Journal, Women’s Running and more. Find her on Twitter at @ashley_lauretta. You’ve heard the hype about waist training and the celebrities who swear by it. But what is it exactly? Waist training refers to the practice of wearing a constricting garment — such as a corset or shapewear — to reduce the size of your waistline. As with any product, there are both benefits and risks, and many in the medical community advise against the use of waist trainers because of common misconceptions about the results and how to properly use them. However, should you choose to add the practice to your daily routine (or adopt only certain principles from it), you must be aware of the proper usage for optimal results. Waist training — also known as waist cinching — became popular in the 1900s, first in Europe and then in America. This was spurred by the invention of the corset, which was replaced later by the girdle. In the early years of waistline modification, the corset was worn on the outside of the clothing and seen as a fashion statement. As the practice of waist cinching grew in popularity, women began to wear girdles and cinchers as undergarments, especially in the flapper era when women desired a boyish, youthful figure. Shapewear is still popular today, though often in the form of Spanx, which is much less constricting and used to slim the body while creating a smoother figure. The popularity of waist trainers is on the rise once again, and celebrities and models have recently admitted to using the garments. Soto says that traditional corsets have laces on the back and are made of cotton, while cinchers are usually made of latex or cotton and have hook-and-eye closures in the front. When it comes to corsets, most think of the traditional ribbon or a steel-boned corset. It has lacing up the back that can be tightened to the preferred firmness, making it very customizable. Cinchers, Soto says, are recommended for everyday use and can reduce the midsection instantly by one to three inches. Additionally, there are workout cinchers, made of stronger materials that can be worn during exercise. “Cinchers like this stimulate perspiration in the midsection, but they are not designed to be worn for an extended period of time,” he says. “This type of cincher should be worn for no more than three to fours hours per day.” But don’t believe the claim that these types of devices are the magic solution to a slimmer waist instantly. You still need plenty of cardio and ab exercises (in addition to a clean, healthy diet) to experience any lasting weight loss in your midsection. Wearing waist-cinching garments may provide temporary physical benefits, such as a smaller waistline and an overall thinner appearance, and may also offer health benefits. Wearing a corset or other compression garment for a long time could give the wearer the advantage of back support and posture control because of the binding and cinching effect. The boning, elastic or rubber material of the waist cincher also gives those who wear them added abdominal support, which can be helpful in reminding you to sit up straight throughout the day or not to overeat. Brad Thomas, M.D., an orthopedic surgeon and founding partner of Beach Cities Orthopedics and Sports Medicine, finds merit to some of these benefits. “One benefit that may be overlooked about waist trainers and wraps are their ability to help an individual activate their abdominal core muscles and inspire good posture,” he says. “Possibly, if they are worn a bit loose as to not completely smash the waist but still pull in one’s tummy, the trainers could have a lasting benefit.” In this case, it’s not necessarily the corset that’s transforming your body directly, but it’s simply serving as a reminder to you to engage your core muscles as you go about your daily activities. It’s important to note that waist training should be an addition to your healthy diet and consistent exercise regimen, not a substitute for one. Soto says that there is a science to modern waist training, and it’s one that’s similar to sauna suits, most often used by athletes to sweat out extra water weight. “The latex in cinchers boosts thermal activity and increases perspiration,” says Soto. “Like any fitness regimen, it’s best to listen to your body’s cues, but with this firm compression around your midsection, your skin will sweat in your target area.” Any weight loss will be temporary water weight, but if you’re prepping for an important event where you want to dress to impress, it can help you look your best. With benefits often come risks, and waist cinchers are no exception. Some of the most common problem are decreased abdominal muscle tone, visceral displacement and atrophy of the abdominal walls. Other health risks include deformation of the stomach, liver and lungs and decreased breathing capacity. Because of these risks, extended use of waist cinchers is not recommended. Soto responds to this, admitting there is a risk — if not done correctly. He explains that the compression of the organs is a common misconception. “It can be dangerous and can compress your organs, but only if waist training is not done properly,” he says. Additionally, he says that those who undertake a waist training regimen should bear in mind that the process happens over time and should not wear a waist trainer too tightly or for too long for faster results. To make sure that you’re waist training properly and safely, the two most important things to consider when buying a waist trainer are the size and materials used in construction. Dr. Thomas says that many waist trainers contain latex, so those with allergies should be especially cautious. Should you have an allergy, Soto recommends you either wear a thin tank top under the trainer or purchase a cotton waist trainer. To prolong the life of your waist trainer, you should properly care for it by washing it every few days with gentle soap. Follow the drying instructions for your particular trainer so it can maintain its shape. If, after understanding the benefits and risks of waist training, you decide to try it, there is a proper way to begin a regimen. A big part of the process is listening to your body and only wearing the waist trainer as long as you are comfortable. Soto recommends you start out slowly and work your way up. With the proper size and by adding more time gradually, many can wear waist trainers for eight to 10 hours a day. For the best results, Soto says that you should work your core muscles with an exercise routine separate from wearing the trainer. Physical training decreases waist circumference in postmenopausal borderline overweight women. 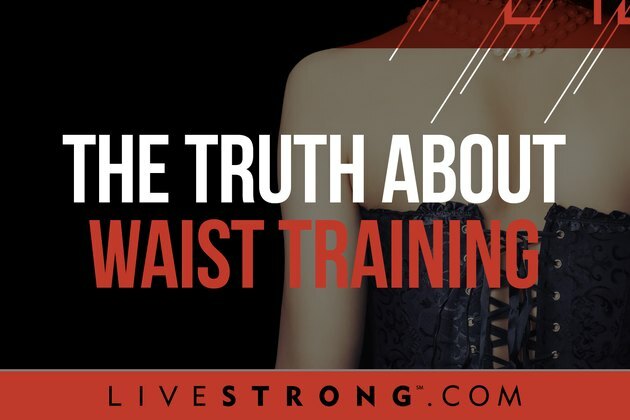 Are Corsets Bad for You? What Kind of Jeans to Wear to Hide the Stomach Area? What Are the Benefits Of Suspenders?